Buying ink cartridges at expensive high street prices is an unwelcome burden for any business. Planet Ink Club offers the ideal solutions to keeping your ink costs down and your business printing smoothly. 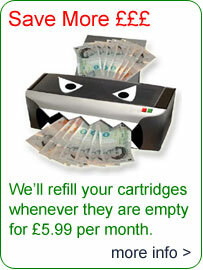 For a low cost monthly fee, we'll recycle and refill your inkjet cartridges with quality ink, as often as you need. Join & we'll send you FREEPOST return envelopes for your empty inkjet cartridges. Return your empty inkjet cartridges via post. We'll recycle & refill your cartridges with quality ink & deliver direct to your door, ready for use. No surprise spikes in costs whenever employees run out of ink, pay just one flat monthly fee for all your ink needs. Whether its quotes, reports or photographs, empower staff to print what they need, when they need it, without worrying about the expensive cost of buying ink cartridges. Planet Ink Club cartridges produce consistent quality prints that a business can rely on. Planet Ink Club is the economical and eco-friendly way to print. Recycling ink cartridges you can print all that your business demands while reducing your businesses impact on the environment.